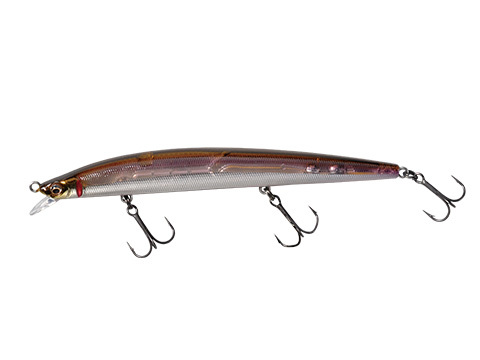 Megabass has succeeded inventing the minnow that will defy the conventional hard-plastic minnow bait. It is X-120. Near perfect spherical balancer is inside its super slim body. The body is designed to give the maximum strength and the same time to give it the extreme details. It is super responsive and its fast pitch rolling action gives out flashings, which will convince not only the game fish but also anglers as well. With its lip, being the half the thickness of pinky nail, the air resistance is kept to the minimum, which assures the maximum casting distance under any circumstances.X-120 will float to the surface when you stop retrieving and its slim body gives amazing long distance darting action.X-120 may be called ‘dart-bait’, rather than jerkbait.